Another large entry of 1,172 cattle on offer at Clogher Mart on Saturday, January 19th produced a strong demand for quality stock in all sections. In the fatstock ring beef cows sold to a top of £1,566 for an 870kg Belgian Blue at £180 and selling to a top of £186 per 100kg for an 800kg Limousin to total £1,488. Cow heifers sold to £1,273.80 for a 660kg Charolais at £193 and selling to a top of £194 per 100kg for a 610kg Charolais at £194. Fleshed Friesian cows sold to £117 per 100kg. Fat bulls sold to £1,373.40. Fat steers overage sold to £186per 100kg. Fat steers underage sold to £182 per 100kg. Fat heifers underage sold to £208 per 100kg. Store bullocks sold to £1,500 for a 780kg Limousin. Store heifers sold to £1,380 for a 700kg Charolais. Weanling males sold to £1,320 for a 650kg Simmental weanling heifers sold to £1,050 for a 470kg Charolais. Dairy cows sold to £2,080, £2,010 twice and £1,910. Breeding bulls sold to £2,020 for Limousin and £2,000 for Aberdeen Angus. Suckler cows sold to £1,550. Reared bulls sold to £650 for Charolais. Reared heifers sold to £690 for Simmental young bull calves sold to £455 for Charolais young heifer calves sold to £340 for Belgian Blue. Tempo producer 610kg Charolais to £194 (£1,183.40) and 640kg Limousin to £186. Armagh producer 660kg Charolais to £193 (£1,273.80), Carrickmore producer 570kg Limousin to £191. Cookstown producer 520kg Limousin to £190. Newry producer 800kg Limousin to £186 (£1,488), Augher producer 560kg Limousin to £185. Derrygonnelly producer 610kg Limousin to £184. Fivemiletown producer 590kg Simmental to £184. Portadown producer 610kg Simmental to £183. Trillick producer 690kg Charolais to £183 (£1262.70) Dungannon producer 760kg Limousin to £182 (£1,383.20), Beragh producer 720kg Limousin to £181 (£1,303.20), Clogher producer 870kg Belgian Blue to £180 (£1,566), Greysteel producer 730kg Limousin to £178 (£1,299.40), Augher producer 640kg Charolais to £178. Randlastown producer 760kg Limousin to £174 (£1,322.40), Strabane producer 520kg Limousin to £173. Greysteel producer 570kg Limousin to £173. Newtownbutler producer 520kg Simmental to £170. Other quality lots sold from £142 to £168 per 100kg. Well fleshed Friesian cows sold from £111 to £117 per 100kg. Plainer types sold from £86 to £110 per 100kg. Poorer types sold from £58 to £78 per 100kg. Armagh producer 930kg Limousin to £143 (£1,329.90), Fivemiletown producer 890kg Limousin to £135 (£1,201.50), Boho producer 940kg Charolais to £131 (£1,231.40), Magherafelt producer 990kg Hereford to £129 (£1277.10) Lisbellaw producer 1,090kg Shorthorn to £126 (£1,373.40). 680kg Charolais to £186. 670kg Limousin to £179. 710kg Hereford to £161. 700kg Hereford to £161 twice. 590kg Limousin to £160. 550kg Simmental to £158. 630kg Limousin to £155. 580kg Charolais to £153. 760kg Simmental to £142. Friesians sold from £112 to £142 per 100kg. 770kg Hereford to £182. 660kg Charolais to £179. 570kg Hereford to £162. 640kg Hereford to £162. 590kg Hereford to £162. 554kg Montbeliarde to £142. Holstein and Friesian steers sold from £122 to £142 per 100kg. 740kg Charolais to £208. 540kg Limousin to £206. 470kg Charolais to 3195. 630kg Aberdeen Angus to 3194. 490kg Aberdeen Angus to £188. 570kg Aberdeen Angus to £185. 450kg Aberdeen Angus to £180. 520kg Limousin to 3178. 450kg Aberdeen Angus to £176. 540kg Hereford to £176. 420kg Fleckvieh to£174. 500kg Shorthorn to £174. 640kg Blonde d’Aquitaine to £170. 500kg Aberdeen Angus to £170. 620kg Limousin to £169. 610kg Stabiliser to £168. 570kg Hereford to £168. 550kg Hereford to £166. A larger entry this week sold to a good steady demand with forward lots selling to £1,500 for a 780kg Limousin (£192), 710kg Limousin to £1,480 (£208), 700kg Limousin to £1,460 (£208), 770kg Limousin to £1,460 (£189), 750kg Limousin to £1,460 (£194), 740kg Limousin to £1,450 (£196), 740kg Limousin to £1,440 (£194), 700kg Belgian Blue to £1,440 (£206), 750kg Charolais to £1,435, 760kg Charolais to £1,430, 750kg Limousin to £1,410, 790kg Simmental to £1,400, 740kg Limousin to £1,380, 720kg Belgian Blue to £1,375, 710kg Limousin to £1,370 and 720kg Limousin to £1360 for a Templepatrick producer Roy Hall Fivemiletown 710kg Limousin to £1,385 ( £195), Des Wilson, Clogher 710kg Charolais to £1,370 (£193), A D J Ewing, Dungannon 690kg Limousin to £1,360 (£197). S D Fencing, Portglenone 460kg Charolais to £1,010 (£219) 380kg Charolais to £870 (£229) and 410kg Belgian Blue to £775. B McAnenley, Omagh 480kg Simmental to £980 (£204) and 480kg Limousin to £905. A J Thompson, Newtownbutler 440kg Limousin to £980 (£223), 500kg Hereford to £965. C S D Johnston 460kg Limousin to £940, 400kg Limousin to £850 and 490kg Aberdeen Angus to £820. J J Morrow, Caledon 470kg Charolais to £930 and 390kg Charolais to £860. F McStay, Lurgan 490kg Limousin to £925, 480kg Limousin to £910, 490kg Limousin to £900, 500kg Hereford to £875. M McCaffery, Rosslea 380kg Simmental to £850. M Granleese, Lisbellaw 480kg Hereford to £845. C M Williamson, Richill 450kg Simmental to £830. Ballygawley producer 440kg Limousin to £775. A brisk demand in this section for a larger entry with forward lots selling to £1,380 for a 700kg Charolais (£197), 680kg Limousin to £1,300 (£191), 600kg Simmental to £1,285 (£214) and 620kg Charolais to £1,230 (£198) for J Connelly, Newtownbutler. D Arthurs, Dungannon 650kg Charolais to £1,350 (£207), F Flynn, Newtownbutler 680kg Charolais to £1,305 (£192), 650kg Limousin to £1,270 (£195), 650kg Charolais to £1,250, 640kg Charolais to £1,240, 610kg Charolais to £1,200 and 600kg Charolais to £1,180. E Greenaway, Dungannon 630kg Charolais to £1,275 (£202), 590kg Charolais to £1,235 (£209) and 590kg Blonde d’Aquitaine to £1,180 (£200), O and A McGready, Dungannon 690kg Charolais to £1,240 and 620kg Charolais to £1,195. O R McElroy, Augher 590kg Simmental to £1,210 and 610kg Simmental to £1,180. G Hagan, Clogher 630kg Charolais to £1,180. J Fowler, Dungannon 540kg Charolais to £1,155 (£213). J Fowler, Dungannon 480kg Limousin to £1,045 (£218), M McCaffery, Rosslea 490kg Charolais to £1,020 (£208), 440kg Charolais to £990 (£225), 460kg Charolais to £980 (£213), 450kg Charolais to £945, 480kg Charolais to £915 and 430kg Charolais to £865. B Snodgrass, Sion Mills 490kg Limousin to £1,005. G Hagan, Clogher 460kg Charolais to £1,000 (£217), D Liggett, Clogher 490kg Charolais to £995. D Haire, Dungannon 480kg Limousin to £975. M Reynolds, Armagh 450kg Charolais to £960. A Alexander and Co, Randalstown 460kg Limousin to £920, 430kg Limousin to £920 and 470kg Simmental to £900. J Edgerton, Rosslea 410kg Limousin to £900 and 430kg Aberdeen Angus to £865. T J McNally, Middletown 420kg Charolais to £860. M McCaffery, Rosslea 400kg Charolais to £880 (£220) and 370kg Simmental to £680. J Edgerton, Rosslea 380kg Aberdeen Angus to £875 (£230) and 370kg Limousin to £790 (£213), S Kelly, Loughgall 400kg Charolais to £785370kg Charolais to £760, and 310kg Charolais to £585. J McGinn, Clogher 370kg Aberdeen Angus to £760. L Poots, Lisburn 370kg Charolais to £720. T Rainey, Pomeroy 400kg Hereford to £705. A sharp demand in this section for 308 lots on offer with steers and bulls selling to £1,320 for a 650kg Simmental (£203), 500kg Charolais to £1,095 (£219), 520kg Charolais to £1,090 (£209), 510kg Charolais to £1,060 (£208), 490kg Charolais to £1,055, 530kg Charolais to £1,055, 490kg Charolais to £1,040, 500kg Charolais to £1,040, 490kg Charolais to £1,015, 520kg Limousin to £1,015, and 510kg Charolais to £1,005 for a Co Down producer. S Kelly, Carrickmore 550kg Charolais to £1,140 (£207), B Collins, Brookeborough 510kg Limousin to £1,105 (£216), C McAninley, Dungannon 520kg Limousin to £1,100 (£211), J Donaghy, Clogher 500kg Charolais to £1,095 (£219), K Stewart, Aughnacloy 400kg Charolais to £1,075 (£269), M Trimble, Maguiresbridge 540kg Simmental to £1,070. P Slane, Carrickmore 480kg Charolais to £1,065 and 470kg Charolais to £1,050 (£223). D McLaren, Dromore (Co Tyrone), 470kg Charolais to £1,050 (£223) and 360kg Limousin to £875 (£243), M and N O’Conner, Augher 440kg Limousin to £895 (£203), C McAninley, Dungannon 360kg Charolais to £890 (£247), Kesh producer 390kg Charolais to £880 (£225) and 330kg Charolais to £810 (£245), J N Allen, Armagh 400kg Hereford to £875 (£219), 460kg Hereford to £865, 460kg Hereford to £820 and 450kg Hereford to £795. J Donaghy, Clogher 410kg Charolais to £870 (£212), Damian Conwell, Donemana 370kg Limousin to £870 (£235), B McKeever, Armagh 370kg Aberdeen Angus to £860 (£232), 370kg Belgian Blue to £830 (£224) and 370kg Aberdeen Angus to £815. P Maguire, Tempo 370kg Limousin to £850. M/S S A and J Keown, Roscor 360kg Charolais to £835. P McCallan, Carrickmore 370kg Charolais to £820 and 320kg Charolais to £820 (£256), K Stewart, Aughnacloy 360kg Charolais to £815 (£226). A very firm demand in this section with a Fermanagh producer selling calved heifers to £2,080 and £2,010. A Benburb producer sold calved heifers to £2,010 and £1,910. B McStravick, Aghagallon £1,900 for calved heifer. J J Gunn, Derrylin £1,380 for calved third calver. G G Galbraith, Castlederg £1,300 for calved Fleckvieh heifer. Others sold from £1,100. F McConlouge £2,020 for pedigree registered Limousin (born 17/03/17), Clarke Dairies Ltd, £2,000 for pedigree registered Aberdeen Angus (born 02/05/15) and J Milligan £1,065 for pedigree non registered Charolais (born 17/03/17). A smaller entry this week with quality lots in short supply however F McElroy, Augher sold a Limousin heifer with bull calf to £1,550. B McWilliams, Seskinore £1,460 for incalf Simmental heifer. Patrick Corrigan, Dungannon £1,405 for incalf Limousin heifer and £1,140 for incalf Charolais heifer. 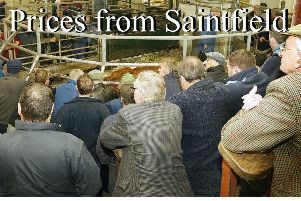 E Connelly, Castlederg £1,320 for 2011 cow with bull calf and £2,011 Shorthorn cow with heifer calf to £950. C McCombe, Clogher £1,120 for incalf Limousin 2011 cow heifer, £1,050 for 2011 cow with bull calf and £1,000 for incalf Limousin second calver. Armagh producer £360, £355 and £345 for Charolais, N V Prentice, Tempo £340 for Belgian Blue, Rosslea producer £340 and £330 for Limousins. P McGee, Augher £315 for Limousin, Lisbellaw producer £310, £305 and £290 for Limousin. Omagh producer £280 for Aberdeen Angus. M A Garry, Dromore (Co Tyrone) £650, £600, £560 and £555 for Limousin. M and P Gleeson, Lisnaskea £620 and £600 twice for Charolais, S Cox, Kinawley £595 and £495 for Charolais, F Murphy, Brookeborough £595 for Limousin, R Douglas, Portadown £545 and £485 for Limousins, £500 for Charolais and £455 for Simmental, C and R, Graham Enniskillen £525 for Charolais, C and J Donnelly, Dungannon £495 for Limousin, P Edwards, Ballygawley £495 for Hereford and £410 for Friesian. J Keys, Clogher £690 for Simmental, M and P Gleeson, Lisnaskea £575, £540 and £410 for Charolais, Pomeroy producer £550 for Simmental, R Douglas, Portadown £535 for Charolais, T Simpson, Ederney £530 for Hereford, S Cox, Kinawley £520 and £475 for Limousins and £505 and £380 for Charolais, C and R Graham, Enniskillen £515 for Charolais and £500 for Limousin, C Treacy, Fermanagh £505 for Limousin, M Armstrong, Fintona £475 for Limousin, T Irwin, Fintona £445 and £415 twice for Aberdeen Angus. D McCarroll, Eskra £440 for Charolais.